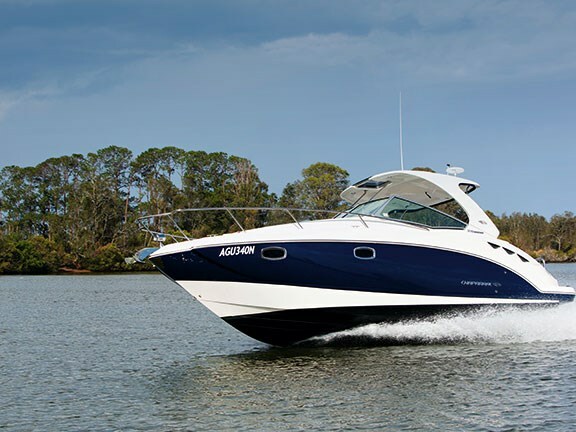 With twin 260hp MerCruiser V8s, the 310 can race to 35kts, with a champagne cruise of 23kts. Hatch in the T-top and opening windscreen centre-pane, along with inbuilt steps in the helm bulkhead and handrails assist in going forward to the bow. For al fresco dining, just clip the table with handy cupholders to the sidedeck. Cockpit’s starboardside wetbar maximises well the available space. Courtesy of the Wide Tech hull is a great feeling of space below – in fact eight can sit on the lounge that meanders around the saloon. Galley is minimalist but has all the essentials. Nicely moulded bathroom will be an easy-clean propostion. 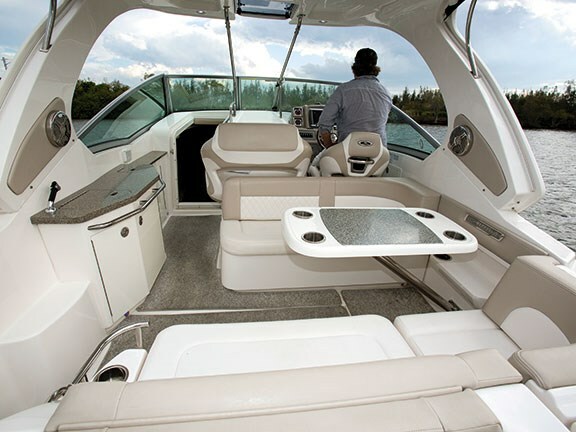 Chaparral’s 310 Signature is either a big-little boat or a small cruiser. Whichever way you look at it, this sporty conveyance will suit a wide range of activities for families looking for something extra. 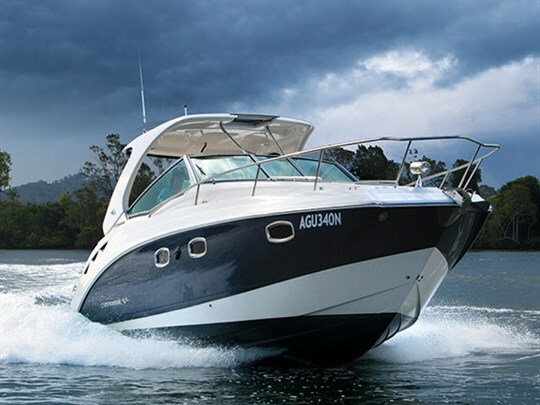 The Chaparral 310 Signature has an overall length of 9.45m and a 3.05m beam, taking it out of the trailerable category but still small enough to be handled by entry-level boaties with a waterfront property or access to a marina or mooring. In this part of the world Chaparral isn't among the mainstream brands, being more of a boutique name with a reputation for higher build-quality and innovative design. 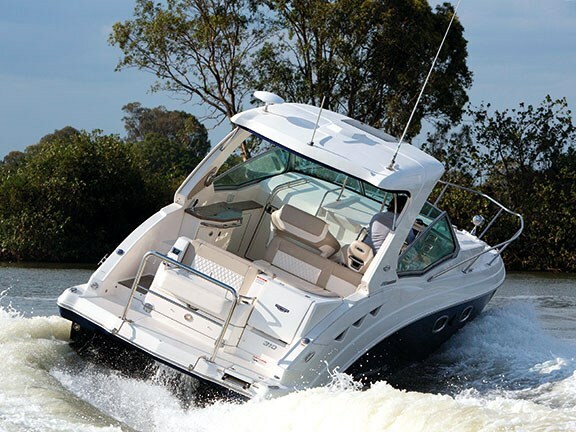 Much better known in its home country Chaparral claims to be the world's largest independent builder of sterndrive powerboats, with a list of industry awards spanning its 50-year history and a production run in that time of more than 300,000 boats. 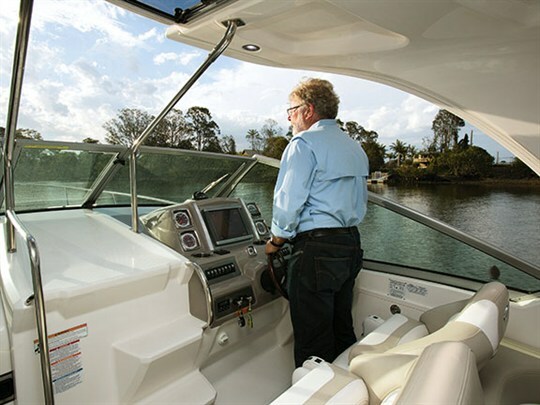 This style of midrange sportscruiser is generally considered a great dayboat and entertainer but the owners of the 310 we tested saw potential for the boat as a coastal cruiser and embarked on an extended voyage over several months. Access to the bow is via stairs moulded into the bulkhead and through the windscreen. An opening hatch in the hardtop means crew won't be banging their head every time they go forward to the sunpad on the front deck. 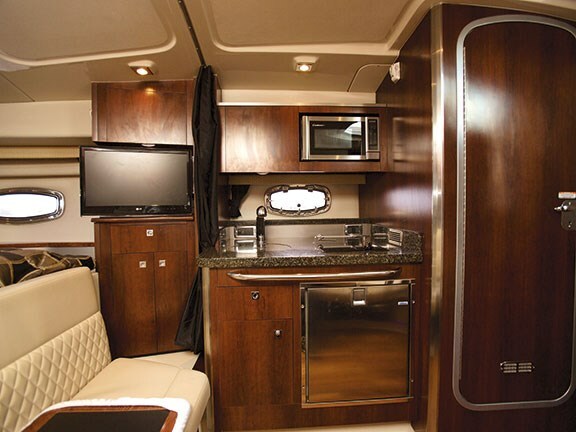 It's in the cabin that the benefit of the Wide Tech hull is most obvious; it's a great feeling of space, especially for a 31-footer. 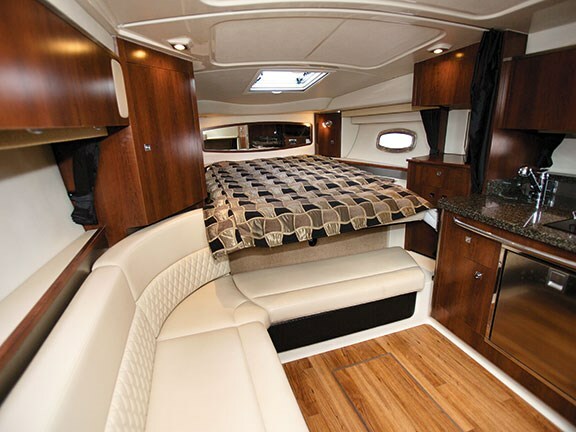 Up to eight people could cosy around the deep-gloss mahogany dining table on the lounge that meanders around the cabin aft of the bed. There's 1.2m of headroom in the second cabin aft of the companionway and under the cockpit floor. It's confined but can be set-up as a second lounge or as a queen-sized bed for a couple. 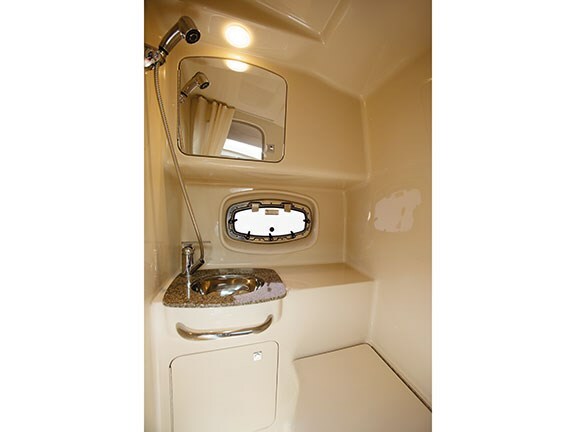 To starboard of the companionway is a head comprising a ceramic vacuum-flush toilet connected to a 106lt holding tank, vanity and a pull-out shower with hot water that can be delivered from electric power or from a heat exchanger when the engines are running. Head height is around 6ft and ventilation is from an opening port and an extractor fan. 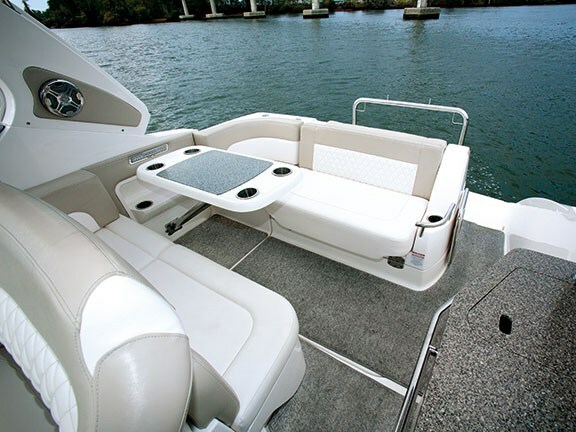 The driver's seat is set on a pedestal and has about 8in of forward-aft travel as well as height adjustment, so it was easy to find a comfortable position with feet set on the bulkhead footrest. The twin-passenger seat has storage below and both seats are fitted with bolsters and clad in rich vinyl with quilted patterns on the backrests that add a touch of class. Twin throttles are within easy reach and SmartCraft synchronisation couples the engines or can be switched to individual control as desired. Cruising at midrange of 3500rpm delivered 23kts and a fuel burn from both Mercurys of 72lt/h. With 447lt onboard, that would deliver a cruising range of 128nm with 10 per cent fuel in reserve. My time with the 310 Signature only helped convince me of the Chaparral appeal. 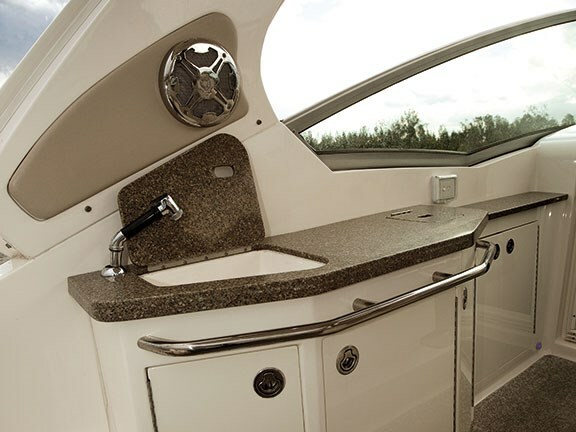 They are well-constructed with lots of features that put these boats in the upper category of brands.